First some facts and figures: The new DVD/CD "Live in Berlin", captures Sting at the city's capacious O2 World Arena in September 2010, a few weeks into the European leg of the tour. The DVD features a generous 22 songs plus "A Conversation with Sting", more on that later. The accompanying CD comprises of 14 songs, including three tracks ("If I Ever Lose My Faith In You", "Fields Of Gold", and "Shape Of My Heart") which aren't included in the concert footage. "Live in Berlin" is produced by Jim Gable and Ann Kim who have been responsible for previous Sting releases such as "A Winter's Night... Live from Durham Cathedral", "The Journey and the Labyrinth", "Inside The Songs of Sacred Love", and "...All This Time" as well as "The Police: Certifiable". They have successfully captured the feel of the "Symphonicity" concerts and while there are obvious limitations to the presentation of a show of this size given the sheer number of musicians on stage, the clever use of three large light boxes above the stage - which occasionally provide live and video footage - light the show superbly and provide subtle, tasteful lighting throughout the concert. The DVD also includes Sting's spoken introductions to several songs, where he explains the inspiration behind a song or offers some other biographical background, and while this would be distracting in a faster paced rock concert, here it works well. The highlights are numerous. Take for example, the unmistakable sound of special guest Branford Marsalis who adds his saxophone to "Englishman in New York", "Mad About You" and "Desert Rose". The word genius could have been coined for Marsalis who adds class to everything he touches, but the Royal Philharmonic Concert Orchestra also has their stars. "All Would Envy" spotlights Chris Cotter's stellar trumpet playing, and Concertmaster Gerald Gregory's violin introduction to "Whenever I Say Your Name" is so exquisite it sends tingles down your spine. The rest of the orchestra are clearly having a ball too - whether it's the brass section cavorting in "Englishman in New York" or the whole orchestra jigging away during a fun version of "She's Too Good For Me". Sting's core group, consisting of Ira Coleman (bass), David Cossin and Rhani Krija (percussion), the ever present Dominic Miller (guitar) and Jo Lawry (vocals), are outstanding, but it's worth singling out the talent that is Jo Lawry. Two tracks in particular showcase her superbly and both are duets with Sting. On "Whenever I Say Your Name" she comfortably fills the part originally provided by the powerful Mary J. Blige - and on "You Will Be My Ain True Love" the combination of her voice with Sting's provides a sublime result. The "Symphonicity" tour offers something for everyone. The hits? Check. The obscure? Check. The never before performed live? Check. Personal high spots have to include "Why Should I Cry For You?" with its' intro borrowed from "Island Of Souls", "All Would Envy", "The End Of The Game" and "She's Too Good For Me". But do you know what? Watch "Roxanne" and be stunned at how Sting manages to reinterpret and refresh one of his oldest and most classic songs with cello and clarinet solos. Simply breathtaking. Rounding off the DVD is "A Conversation with Sting", an interview segment where he explains how the idea for the tour developed, his philosophy that songs are not museum pieces and how he constantly tries to reinvent his music. The footage where he is joined by Branford Marsalis is especially enjoyable - their easy friendship and mutual respect is immediately apparent. All in all, this is an excellent reminder of a highly memorable tour. In our household it will also serve as a reminder not to jump to conclusions and to keep an open mind! 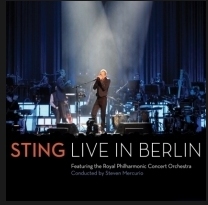 Sting - Symphonicity Tour - Accompanied by an Orchestra Conducted by Steven Mercurio. Event shines spotlight on humanitarian film and music.